At our local quilt guild in-town return, one of our members demonstrated how to make a log cabin house using one inch strips. Mine is not perfect but I wanted to learn the technique. 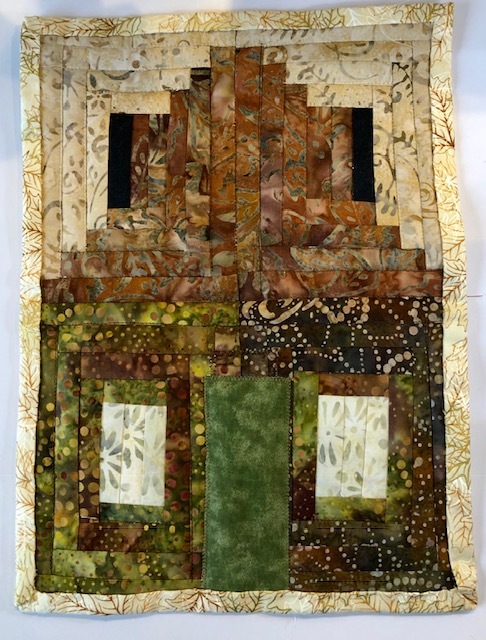 Thanks for stopping in; happy quilting - Judy. 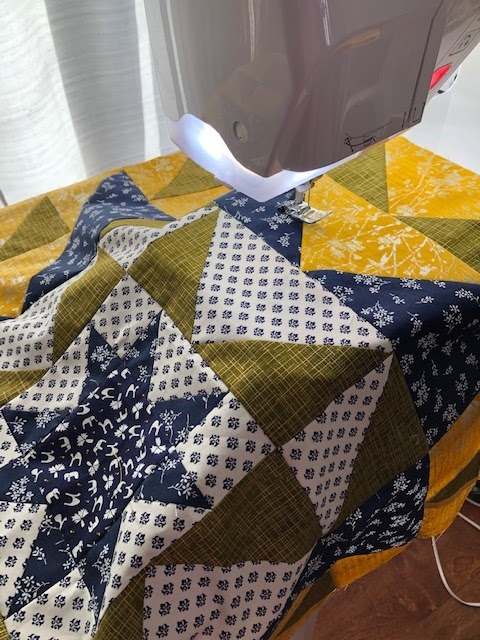 Months ago, I started the Medallion Mystery Quilt but didn't keep working on it. A couple days ago, I decided to start working on it again. I have made some progress that I'll share with you. It's not done but I'll keep working - Judy. At one of our monthly quilt guild meetings, one of our members showed several of her gorgeous Irish chain quilts. Some were antique quilts and some more recently made. 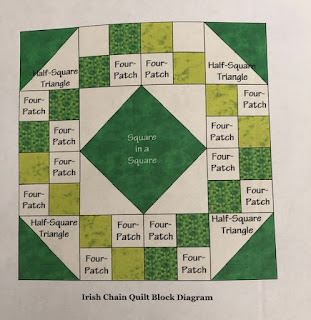 I was so impressed and new I wanted to attempt to make an Irish chain quilt. I ordered Eleanor Burns "Irish Chain, Quilt in a Day" book. 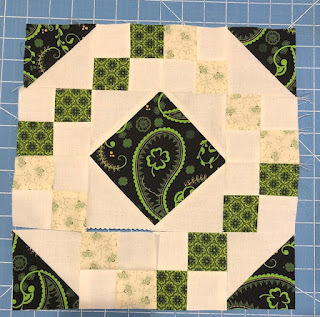 Well, my intentions were high but I didn't think I was ready for Eleanor's pattern so I started a block using an Irish Chain block pattern that I saw online. Fabric that would be appropriate for St. Patty's Day were selected. I made several of the 4 patches for the above block. 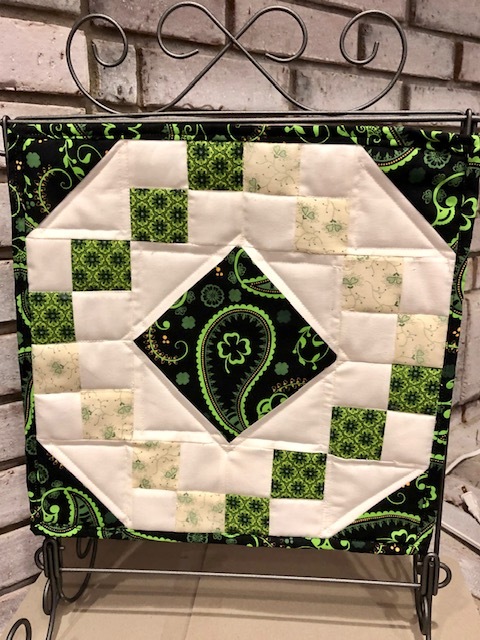 I finished one block and my mind told me to quilt and bind it to hang on my 12 inch hanger for St. Patrick's Day. So why not, I needed a new 12 inch for March and now it is done. 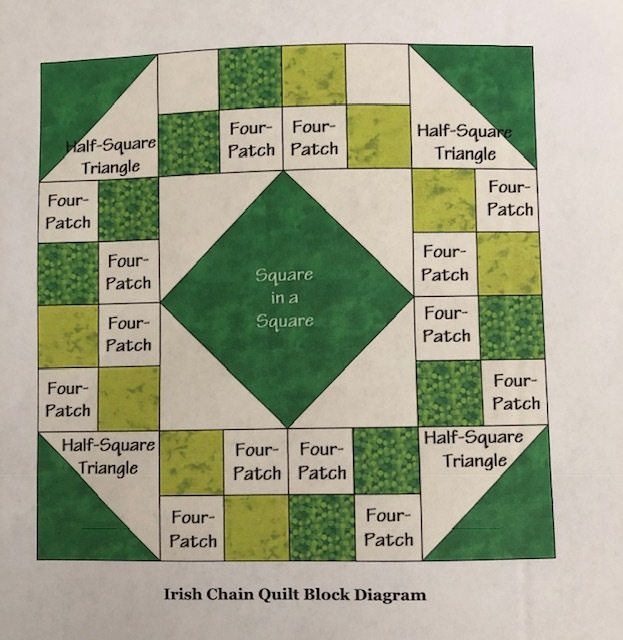 I may attempt a bigger Irish Chain quilt at another time. I thought my light green was a little too light so I'll keep that in mind for my next Irish Chain. Thanks for stopping in - Judy. Another project that is "done" for 2019. Although it is not perfect, it is done. My corners are getting a little better. You can see my tabletopper used in a tablescape on my other blog. Click here. 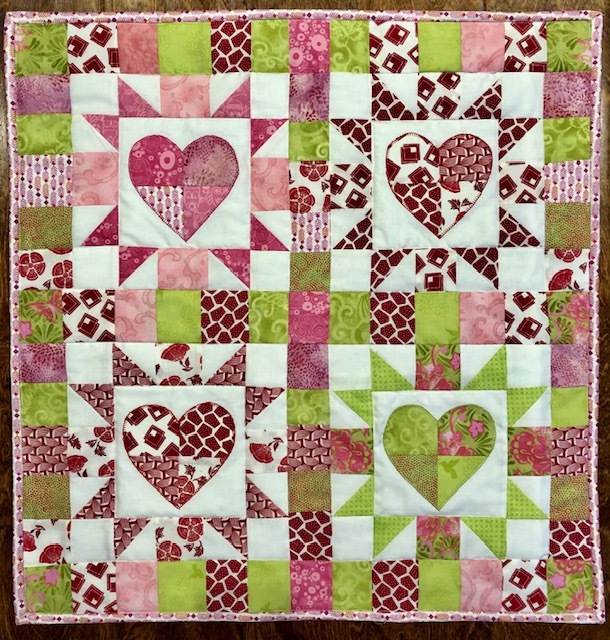 Here is a link to the pattern for this 4-Patch Mini Heart quilt. Time to move on to a few projects for March. Thanks for stopping by - Judy. 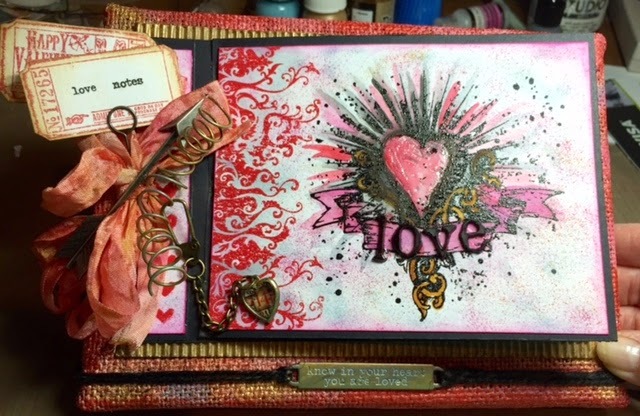 I haven't had much time to work on my Valentine Table Topper. Block 1 is just about done. 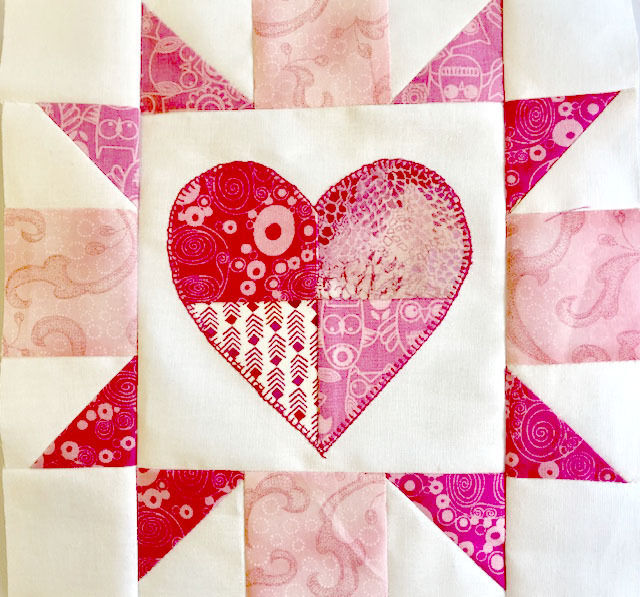 Just have to applique the heart on to finish the block. 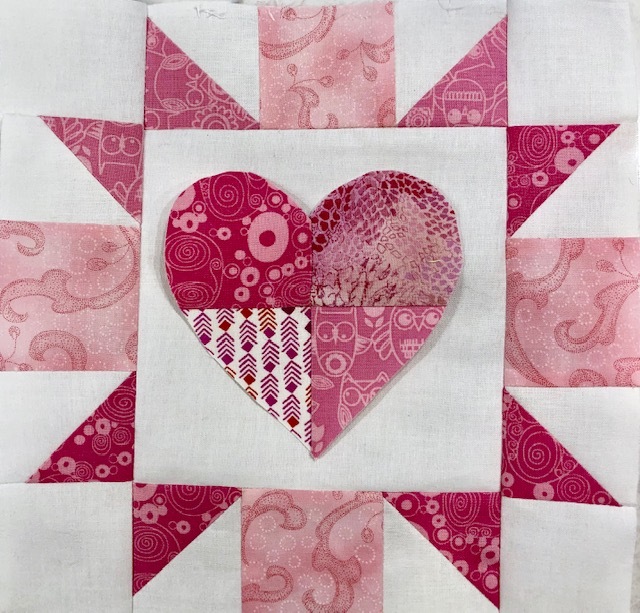 Update: I have the heart appliqued and ready to start block 2. Thanks for stopping by - Judy. 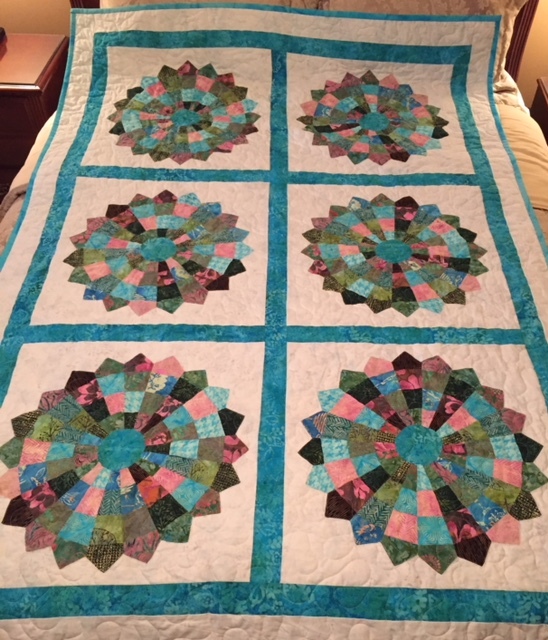 This month was a little slower quilting month for me. 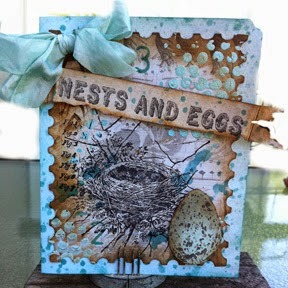 I finished a couple of projects to share with you today. 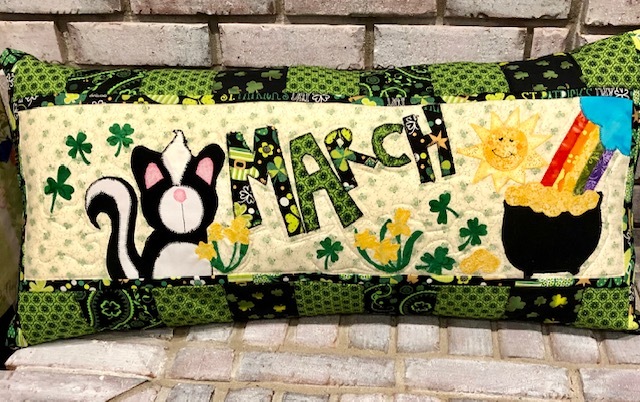 My February bench pillow is complete and on the pillow for February 1. 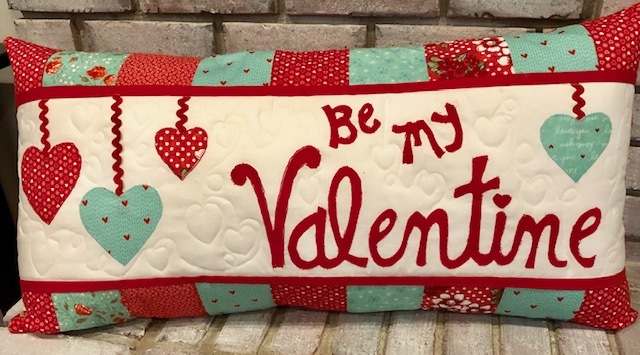 The pattern "Be My Valentine" is by Kimberbell Designs. 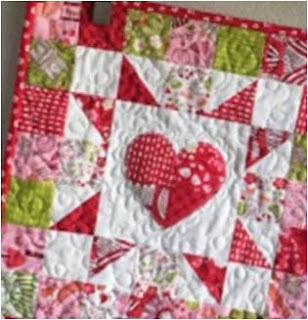 I did free motion quilting on the white background with some hearts and swirls and loops. 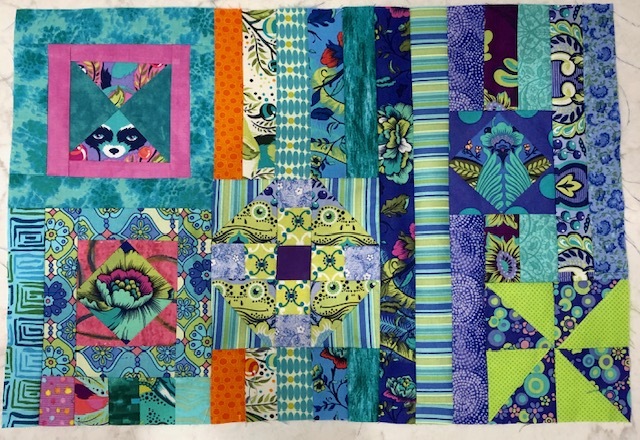 This 12 inch quilt was a coloring book page I found online. 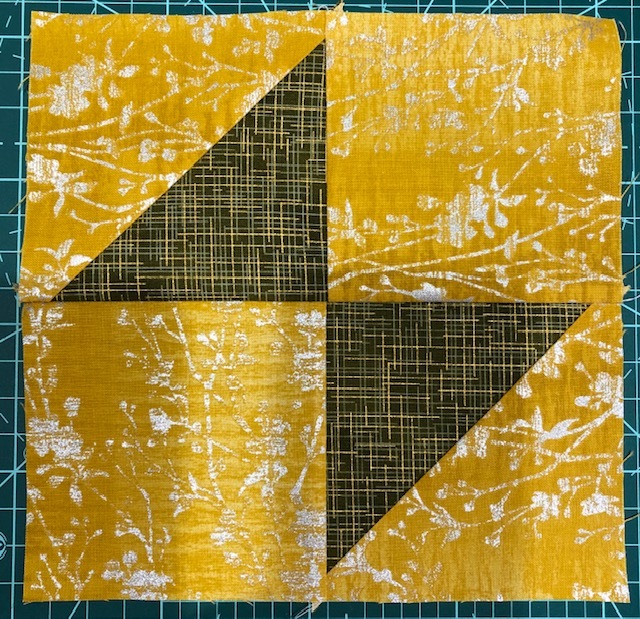 Three fabrics cut into 4.5 squares were used for the background. I may not be completely done with this one. I think I need to add something else to it. What do you think? 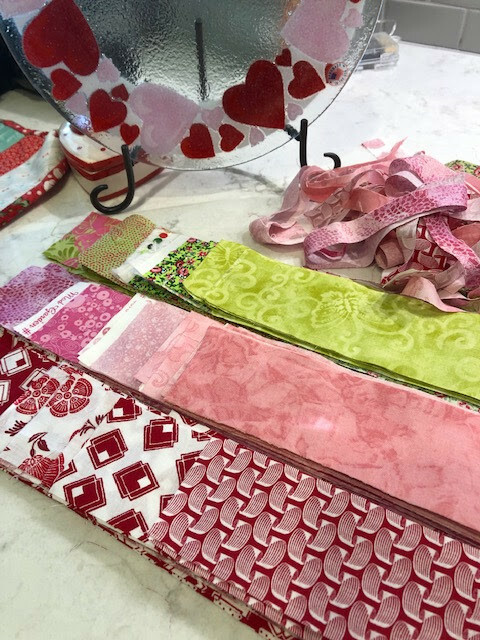 I started cutting 2.5 in strips with my Accuquilt Cutter for a another Valentine project. Not sure if I can get this project done by Valentine's Day but I'll give it a try. I have six greens, six pinks, and 6 reds. Now these strips have to be cut into 2.5 in squares. 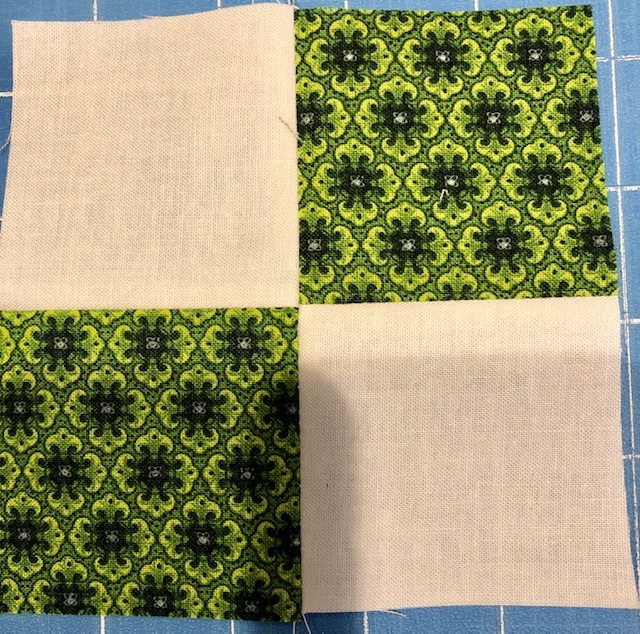 Just so you don't have a bit of anxiety wondering what I'm going to sew, I'll give you a pic of one of the blocks. My quilting guild in having an in-town retreat this weekend so I'm hoping to make some progress on this project. Thanks for stopping by - Judy. 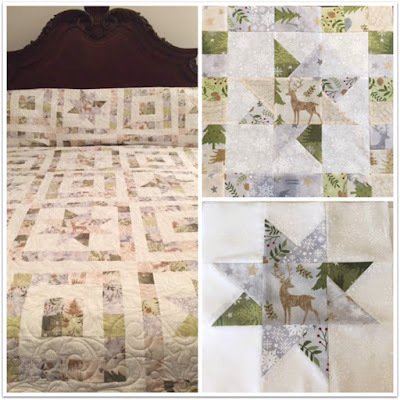 I finished a few quilting projects in December. 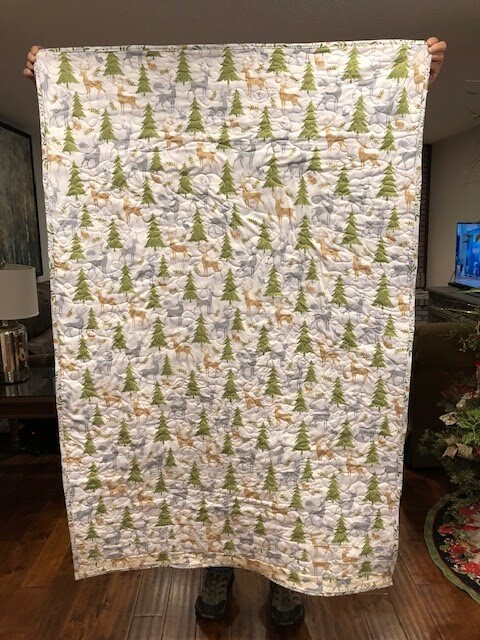 I found a panel online that was from the fabric line that I used to make a Christmas quilt for my daughter in 2017. I still had lots of jelly roll strips from the fabric and thought I could make some simple blocks to add around the panel. Luckily, I had some yardage left from the original quilt project and used it for the backing. Now, there is just a small amount of fabric left from the collection. 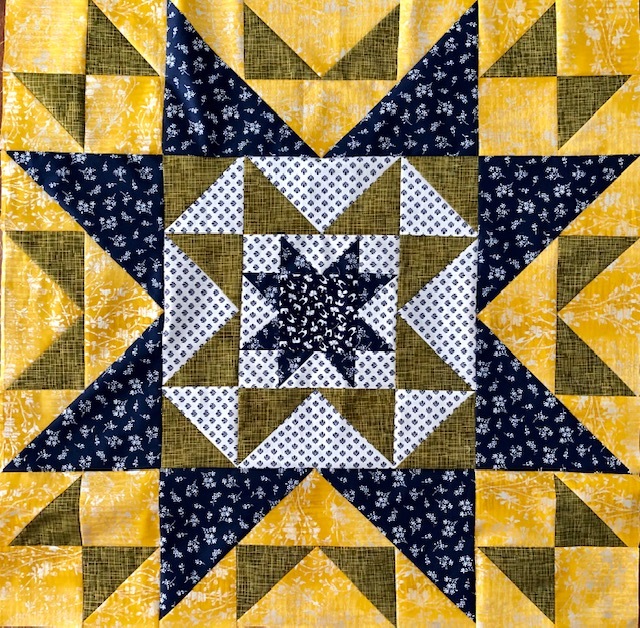 Here's the original quilt I made in 2017. 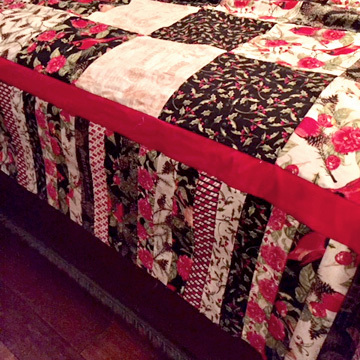 Another December project was to use some extra fabric from another Christmas quilt. 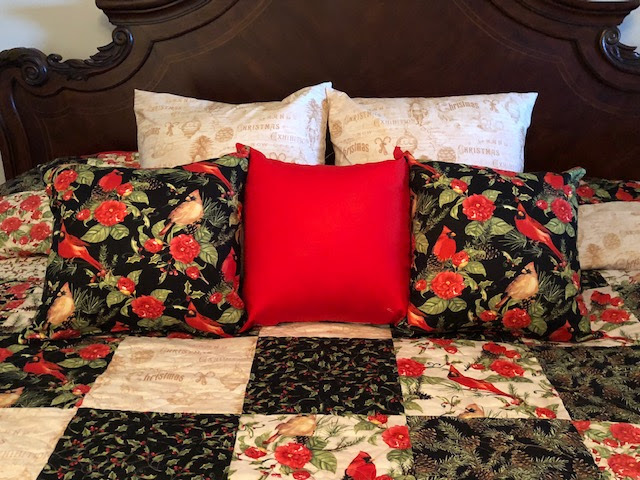 This time a few pillows were made and again my extra fabric went down a bit. YAY! 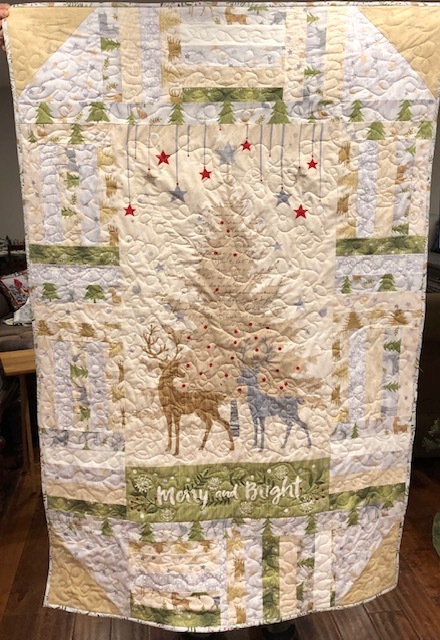 Here's that Christmas quilt and the piano border that I used. It was finished early in 2018. 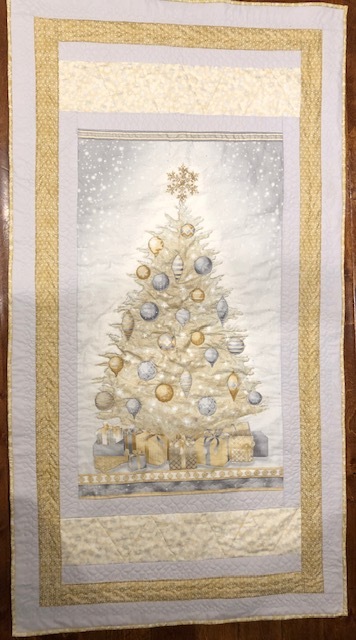 My final project for 2018, was a Christmas throw for myself. 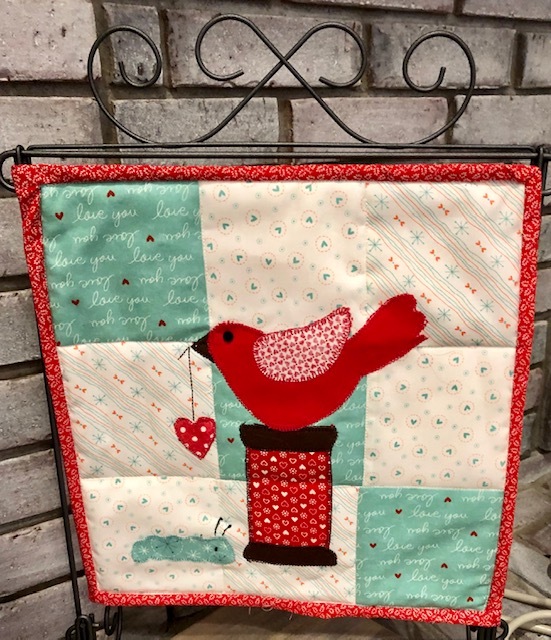 This one was a kit for a wall hanging but I decided to take the backing fabric and some gray fabric in my stash and add borders. I did have to purchase a metallic fabric for the binding. 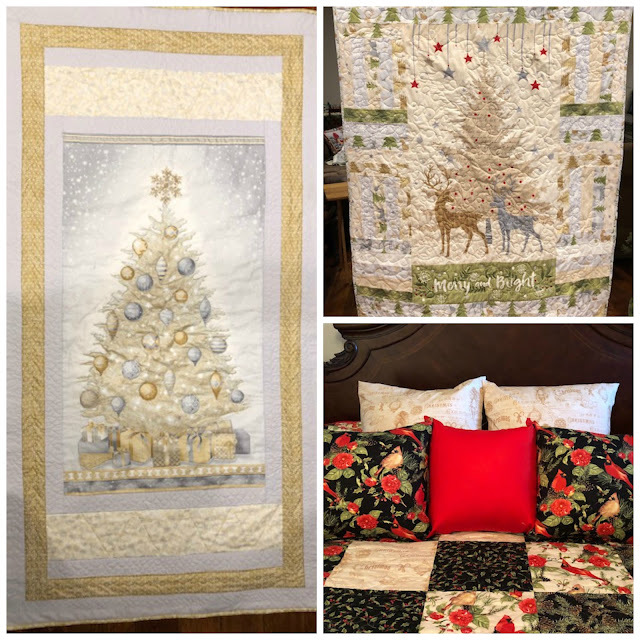 That's a wrap for my Quilting Projects in 2018, on to 2019! 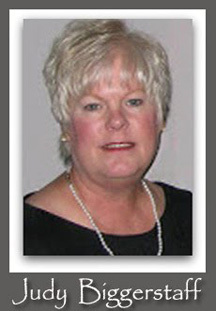 Thanks for stopping by - Judy.